The Caselogic TBC-302 Ultra Compact Camera Case w/Storage is compatible with ultra compact point and shoot cameras. Durable dobby nylon and interior padding protect your camera against daily wear and tear Carabiner and belt loop allow for easy transport. 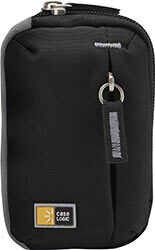 Zippered pocket (Storage) stores memory cards and other small accessories. Internal Dimensions: 3.9" x 2.4" x 1". 25 Year Warranty! Full-featured ultra point and shoot camera protection. The Case Logic TBC-302 Ultra Compact Camera Case w/Storage is compatible with ultra compact point and shoot cameras. Its durable dobby nylon and interior padding protect your camera against daily wear and tear, while a built-in carabiner and belt loop allow for easy and convenient transport in all situations, including attachment to interior and exterior bag loops. More than you ever thought, Case Logic produces portable storage for every segment of your modern life. From conveniently-sized compact cameras to full-featured SLRs and all photo equipment in between, Case Logic has cases, slings and backpacks to take them wherever people are capturing moments. For those who carry a tablet or any of the most popular laptops from small to almost-too-big-to-be portable, there's a Case Logic sleeve, attaché, briefcase, messenger or backpack to fit and protect with confidence. And Case Logic continues to simplify people's lives with a wide range of cases to transport CDs, DVDs, hard drives and the latest portable electronics.